Newport-Mt. 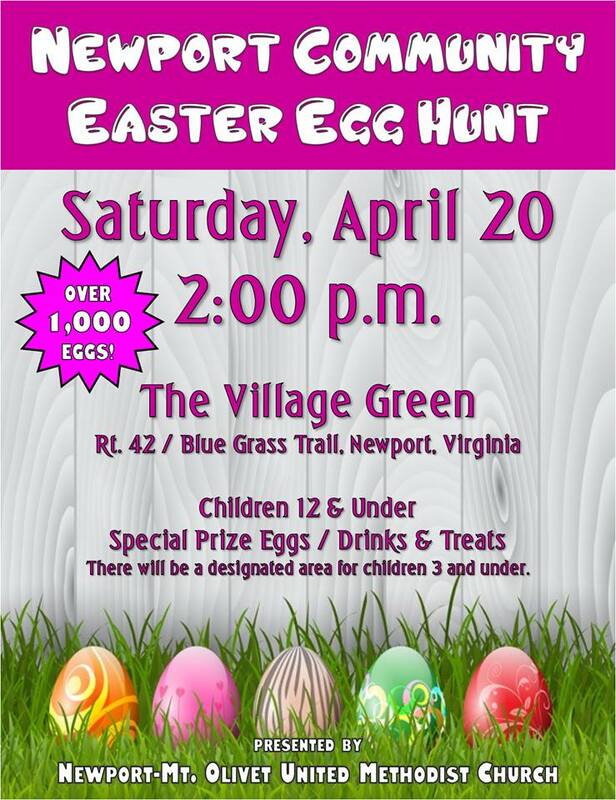 Olivet United Methodist Church presents the 2019 Newport Community Easter Egg Hunt for children 12 & under on Saturday, April 20, 2019 at The Village Green in Newport, VA.
Join us for the annual Newport Community Easter Egg Hunt at the Village Green in the heart of Newport. Over 1,000 eggs will be hidden! This event is free for children 12 and under with prize eggs, treats and drinks. There will be a designated area for children 3 and under. The Village Green is located off Route 42 / Blue Grass Trail in Newport, VA near the Newport-Mt. Olivet United Methodist Church. To view the event flyer, visit: https://i.imgur.com/gcdACgs.jpg. For more information, visit: http://nmoumc.org/events/ or https://www.facebook.com/events/2298025153801053/ or https://www.facebook.com/NewportMtOlivetUnitedMethodistChurch/.